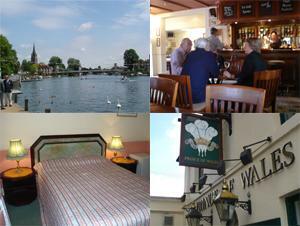 The Prince of Wales, United Kingdom is situated in the heart of Marlow upon Thames. 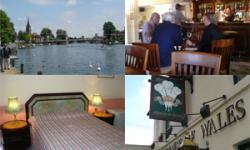 Marlow itself is rich in history and well known for being one of the most attractive towns in the South East. Set on the Thames, the 19th century suspension bridge helps form an unparalleled view for a walk along the Thames. The Prince of Wales boasts a large Bar, which almost doubled in size in 2004. A warm atmosphere and comfortable surroundings help make th Bar one of the most popular in Marlow. The Prince of Wales Bar is credited as having 'some of the best beer in the area' and are proud to sell Rebellion beer, Marlow's local brewer. On Tuesday nights is quiz night at the Bar and for 3 years now, the Prince of Wales has run a popular Bar quiz. There are prizes galore and festivity a plenty that draw out the crowds. Bring along your friends and enter a team - all are welcome so arrive by 7.00 to secure your seats. The Prince of Wales has a Thai Restaurant with a Take-away service as well.